Wilhelmsen Ships Service (WSS) is aiming to consolidate its position within the Ships Agency segment by building stronger agent-customer relationships. By doing so, Frederic Fontarosa believes the firm can offer enhanced efficiency, understanding and value. Frederic Fontarosa is a people person. Mixing an easy going, laid back French-American drawl with suddenly energetic outbursts on subjects close to his heart, he’s engaging to talk to and easy to like. Seated in his Houston office, although rarely sitting still, the WSS Director Ships Agency Americas is taking Maritime Reporter & Engineering News through his ambitions for a division of the global business that serves 581 regional ports and an average of 2000 vessel calls every single month. “It’s about the people,” he said. “Our people getting closer to the customer, and the customers’ customers, to understand their trading patterns, requirements and how our service solutions can help them meet their individual objectives. “We’re a big company, but that doesn’t mean we can’t have close customer relationships – in fact our size actually makes it easier.” Fontarosa isn’t wrong about being big. Ships Agency is one of the oldest divisions of the worldwide Wilh. Wilhelmsen Group, and over its 40 year history has grown into a giant; boasting 1250 employees, 182 dedicated offices (alongside 438 sub agency offices), with the capacity to service ports in 132 countries. This size, as Fontarosa points out, brings obvious benefits for customers: “With a trading environment of low earnings, tight credit and high costs, a ships agency with our global network can offer international shipowners compelling advantages. These include the standardization of services, global reach, compliance, certified employees, quality assured processes, E&O insurance coverage, data availability, and modern, integrated IT systems. The efficiencies associated with this breadth of offer are immense. But for all those benefits, some would argue that, in the world of ships agency, small is beautiful. Being small means these ‘mom and pop’ businesses can be personality focused, allowing them to forge close relationships with repeat customers. Isn’t this something an agency the size of WSS struggles with? The return of Fontarosa’s smile suggests not. 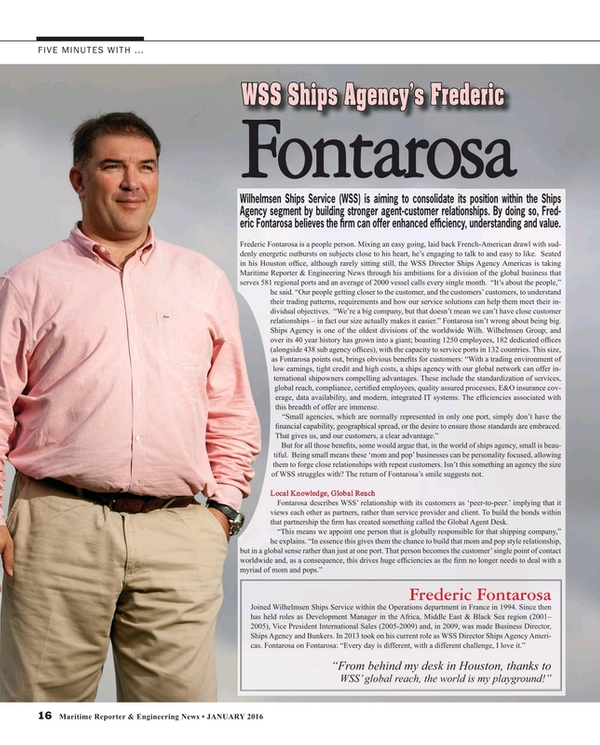 Fontarosa describes WSS’ relationship with its customers as ‘peer-to-peer.’ implying that it views each other as partners, rather than service provider and client. To build the bonds within that partnership the firm has created something called the Global Agent Desk. And such through-the-line efficiency, Fontarosa remarks, is key to “the new breed” of international ship operator. When outlining the benefits of his firm there’s a coterie of keywords that continually spring from Fontarosa: The ‘efficiency’ that comes with global reach and scale, the ‘standards’ that one unified international operation can deliver for shipowners, and, the final one, ‘intelligence.’ “Translating the vast amount of information from our ports across the world into relevant intelligence yields real competitive advantages for our customers,” he says. When asked what he means by this he responds with an explanation of WSS’ Trade Talk Desk. “That encapsulates our added value/intelligence proposition,” and is an area for investment for the company, Fontarosa said. “In 2013 WSS created the Trade Talk Desk in four strategic locations around the world – here in Houston, Singapore, Geneva and Dubai. The desks, which work across their time zones to give our customers 24-hour coverage, deliver relevant, timely and accurate information to our customers. They structure this data and package it in a way that is easy to understand and access.” This information is broad-based and comprehensive, covering everything from port news and port facilities developments, through to cargo statistics, vessel line-ups and breaking news, such as a port closure due to bad weather. “By presenting this vital information in one package, from one source, customers get the intelligence they need, when they need it,” Fontarosa stresses, “rather than being swamped by a million different emails from a range of different companies all round the world. As the interview draws to an end, WSS’ Ships Agency Director Americas reveals that he is as almost as global as his employer. “I was born in France, to an Italian mother and Spanish father, moved to the U.S. to study, liked it and stayed. After graduating I’ve lived and worked in the Caribbean, Scandinavia, the Middle East, Southern Europe and now I’m back in the U.S.” He laughs: “That international perspective gives me a foundation to understand and adapt to different business cultures and the opportunities and challenges they represent. WSS is the same. Its global understanding and local knowledge helps it provide the best services to all its customers.